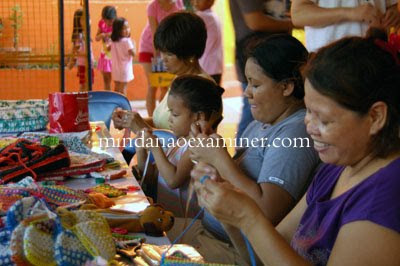 The Mindanao Examiner: Can Websites Fight Poverty? QUEZON CITY, Philippines - It began six years ago with a gathering of 30 unassuming women from struggling households. The meeting place was rather downcast-Tatalon, Quezon City is one of the most destitute communities in Manila. However, the talk in the microfinance lecture was jovial and even hopeful. Each mother or young wife was absorbed, looking for ways to straighten out their living conditions. Their words drifted across the room like lifeboats in a wide and stormy sea. Until someone who had just arrived unannounced turned to listen, and the words reached her heart like lifeboats touching land to call home. The unexpected visitor was former president Tita Cory Aquino. The women, upon noticing the PinoyME chairperson, scrambled to give her a decent seat. However, Tita Cory only gently asked them to ignore her and to continue their meeting. She was there to hear out what they had to say. A woman asked shyly asked where she could get a loan of P2000 for a banana-cue kiosk. Another said she needed P5,000 to maintain her sari-sari store. As Tita Cory quietly listened to their plans, she became convinced that microfinance was the most potent tool to provide the women means to build more prosperous lives. With sufficient training and support, poor Filipinos can bring an end to poverty. These were the lessons and the words she heard in Tatalon-words she gave voice to, and shared with businessmen, NGO workers, and others when she called out for support for her last advocacy-a new people power that would translate to better lives for more Filipinos, the People Power of Microenterprise Development. "Over the past year, I have been inspired by the noble work of microfinance institutions which have reached out to the entrepreneurial poor, giving them the means to uplift their lives through honest and hard work," she said in one of her last speeches. "The small but steady income from their microenterprises makes it possible for them to eat decent meals, to send their children to school and to nurture dreams of a better life." If there was one great act that our former president never stopped doing, it was that she always took time to listen. Perhaps it is for this reason that many consider her the mother of Filipino democrocacy, and why so many of us relate to her to the point that we braved the rain and choked back tears during her funeral. In the case of the women microentrepreneurs, she listened and brought about PinoyME, a vehicle to support microentrepreneurs through funding, training, capacity building, and by helping them find markets for their products. On its fifth anniversary, PinoyME gathered with other stakeholders to discuss and build on the efforts of the private sector to empower enterprising Filipinos in poor communities. It brought about promsing dialogue and partnerships that PinoyME seeks to cultivate through a website. The DPC Yellow Pages, the market leader in directories advertising in the country, volunteered to produce this website, which would serve as online portal for all microentrepreneurs and microenterprise stakeholders. It is envisioned to be a virtual marketplace where big companies, small producers, consolidators, and other service providers can make inquiries, exchange information, forge partnerships, or even make transactions. "The whole thrust is to use people power for people to help themselves," DPC president Bong Bautista said. " I myself have been a entrepreneur for the last 40 years, and I know the issues. Most entrepreneurs know the operating side. If I'm a tailor I know how to sew, if I want to put up a microenterprise like a pandesal store I know how to bake. But the shortfall of most microentrepreneurs is marketing. They probably know how to sell, but the marketing side is not that easy. "You are there in some barrio or even in a big city, even here in Metro Manila, you're out there starting your small trading company-how do you market this? If you do not have a huge budget for advertising, how are people going to know what you are offering? And then here comes the People-Powered Markets website." "I remember more than ten years ago I used to be supplying a company. But that needed me to talk to some friends, to some executives. And it took some time, months before I can do my first shipment-e ako may network. But what about those small guys? How will they be able to tap that market? These are your neighborhood bakeries, the trading companies. We are probably their only source of advertising, their only souce to connect to the rest of the world." The People-Powered Markets website is modeled after the Yellow Pages website with functionalities that allow a consumer to find a product in a specific location. For instance, if one is looking for a sari-sari store in San Pedro, Laguna one only needs to type "sari-sari store" in the What search box, and "San Pedro, Laguna" in the Where box. A list of sari-sari stores will then be provided after a clicking the Find it button. Moreover, the website will incorporate social network features that allow microentrepreneurs to upload profiles of their businesses, including photographs of the products and maps to help customers find their stores. This would be huge help to a microentrepreneur such as a stuff toy maker or food vendor who can now go to a nearby computer shop, and advertise teddy bears or tapsilog to buyers online. The site will more importantly help big companies partner with microentrepreneurs as it provides them a database of small businessmen and their products. "Our vision is really very simple. To develop a marketplace so that the buyers and sellers could meet," said Bautista. Bautista is particularly proud and excited about the website. He explains that while DPC Yellow Pages has worked before with NGOs in community development projects-DPC volunteered its employees in house-building efforts with Gawad Kalinga-this is the first time that the company is using its "core competencies" of creative advertising and marketing to be a driving force for change. "We have been doing this thing for so many years, and this is something I can do to help rebuild our country," said Bautista. The page of the social network Facebook recently published a story of a Filipino, Jay Jaboneta, whose Facebook status generated a fundrasing campaign to buy boats for 200 elementary school children who used to swim half a mile to school everday. The new yellow boat, called Bagong Pag-asa, gives the kids free rides to school during the week. Seaweed farmers can also use the boat to take their products into town for a small fee. Stories like this reflect the power of the Internet to encourage collective action that concieves a productive impact in a community. It is this power that PInoyME and DPC Yellow Pages would like to harness as a tool to empower microentrepreneurs. The advent of the Internet has opened so many possibilities for people to market their products. For some companies, the website is the centerpiece of the communication or distribution channels-with the ability to inform and sell to the most number of people. The People-Powered Markets site provides every microentrepreneurs who signs up with a microsite that is searchable by the entire Internet-surfing world. It gives them the opportunity to partner with the leading companies such as Jollibee and Petron or other microentrepreneurs. Most importantly, it provides enterprising Filipinos in poor communities with the power to get heard, to connect. And as that meeting between the Tatalon women and Tita Cory shows, each time we listen, each we take time to connect with other Filipinos, the seeds of a more lasting People Power are being sowed anew. The impelling need to support farmers and other enterprising Filipinos in agricultural areas brought together stalwarts from microfinance institutions (MFIs), development NGOs, the banking community, and the government for the Multi-stakeholder Conference on Value-Chain Financing on Agriculture and Rural Microenterprise. The gathering held on April 12 at the Landbank Plaza Manila was organized by PinoyME and the Microfinance Council of the Philippines, Inc. (MCPI) to catalyze opportunities for collaboration among different sectors to assist the growth of farm and other rural enterprises through value-chain financing. The conference gathered more than 150 microfinance stakeholders, including Secretary Virgilio de los Reyes and Undersecretary Jerry Pacturan of the Department of Agrarian Regorm, Liduvino Geron of Landbank, Lalaine Joyas of MCPI, Ma. Piedad Geron of the Asian Development Bank, Marie Valdez of the Grameen Foundation, Nestor Raneses of the University of the Philippines Institute for Small-Scale Industries, and Marilou Velasco of the National Anti-Poverty Commission. Professor Ronald Chua of the Asian Institute of Management in his Overview of Value-Chain Financing defined values chains as "the full range of activities and services required to bring a product or service from its conception to sale in its final markets - whether local, national, regional, or global. Value chains include input suppliers, producers, processors, and buyers. They are supported by a range of technical, business and financial service providers "
He then described value chain financing as "financing provided to or by a value chain actor in order to increase value-chain growth and competitiveness." A successful value chain model to support rural enterprises is that being carried out by Jollibee and farmers from Nueva Ecija and Bukidnon. With the partnership, the farmers now have a dependable market--their crops are bought by Jollibee for its requirement of fresh ingredients like onions and bell peppers. The other players in the value chain are The Catholic Relief Service Philippines, which promotes market-driven strategies to facilitate farmers' participation in the mainstream market, the National Livelihood Development Corporation, a government corporation that provides for the credit needs of farmers, and the Alalay sa Kaunlaran, Inc. (ASKI), a microfinance institution that directly delivers the funds to the farmers cooperative. This model of sharing the risks in rural finance and leveraging the competencies and resources of different players to strengthen the agricultural enterprises is an inititative, which PinoyME seeks to calalyze all over the country. Joey Bermudez, chairperson of Maybridge Asia, Inc., explained the weighty importance of strong value chain models, especially for agricultural enterprises. He said that "risks in rural finance will be unwieldy as long as value chains are weak." Bermudez added: "A value chain is only as strong as its weakest link." He then presented how the "weakest link" can weaken the entire value chain. For instance, if rice farmers plant less because of raw weather, then there will be a dearth of rice for consumers. Moreover, fertilizer merchants will also sell less. MFIs will also have a low repayment rate if the farmes who borrowed from them do not have enough profit to settle their loans. The weakness of the farmers will diminish the entire value chain. Joselito Almario, Deputy Executive Director of National Credit Council - Department of Finance, then provided the stakeholders a survey of opportunities for Public-Private Partnership for Risk Protection in the Agriculture Sector. He pointed out key roles for both government and the private sector to accomplish. Almario was moreover unwavering when he called out for cooperation among all stakeholders. "Agricultural finance goes beyond production loans. It necesarily involves the whole supply and value chain process. More importantly in involves all of us," he said. The next lecture by Mario Valdez, General Manager of the Philippine Insurers and Reinsurers Association, covered Private Sector Initiatives on Risk Protection. While Valdez zeroed in on the importance of insurance for rural enterprises, he said that " agricultural or crop insurance is really an adjunct to a whole set of risk management measures of which adequate farm management practices constitute the most important." He added that "insurance by itself is no substitute for good production practice," and that stakeholders can help out by identifying "existing gaps and inefficiencies by analyzing cost structure of the system and seek ways to reduce these costs and increase productivity." After the lectures on policy issues, stakeholder representatives shared their experiences in agricultural finance and their responses to the presentations. Jane Manucdoc of ASKI was the representative for MFIs; Atty. Ronald E. Alvizo or Enterprise Bank spoke for the rural banks; Jinky Flores of Gata Daku Multi-Purpose Cooperative presented the experiences of cooperatives; Maria Agnes Angeles of the Planters Development Bank represented private banks; while Undersecretary Jerry Pacturan represented the government. The sharing of ideas was very informative and cordial, and there was laughter when Jane Manucdoc quipped that "prayer" was one way for MFIs to minimize the risks of lending to farmers. Each participant agreed that collaboration among the different players was an indispensible step to improve rural financing practices. 1. Developing insurance and guarantee products - A mechanism or task group must be brought about to advocate for solutions to policy bottlenecks, particularly in the areas of credit, contract enforcement, and guarantees. Government should also address issues that affect the agricultural enterprises such as prices and security. 2. Improve Farmers' negotiating capacity - This entails capacity building of key institution in the value chain, including training on entrepreneurship, negotations, and financial literacy. Insurance products for agricultural businesses should also be developed. 3. Address the policy issues - There is a need to fast track the availability of credit information for MFIs; the credit bureau should be established. 4. Continous capacity buiding of insititutions - We should continue the development of value chain models. Value chain models such as that of Jollibee and the Nueva Ecija farmers should be evaluated and replicated in other rural areas. A better awareness and understanding of value chains and and value chain financing mechanisms must be cultivated among stakeholders. Mechanisms for value chain sharing and collaboration at the local level should be brought about. Value chain managers should also be trained to ensure the development of various agricultural value chains. "They are hard working, good, fast learners. They can perform other related tasks, are flexible and thorough of course. They're satisfactorily prepared to a microfinance practitioner." This is how Brenda Flora of the Simbag sa Pag-asenso, Inc, describes Janice Ogao and Jim Berrido, the new graduates who have started working for the microfinance institution. Janice and Jim are among the first to earn a Certificate in Microfinance for Loan officers, which is the initial step in the ladderized program of the BSBA Major in Microfinance. The two have studied under the Dual Training System Competency-Based Education (DTS-CBE) for Microfinance, a program designed by PinoyME and its partners to make sure there are quality individuals who can contribute their talents to the microfinance industry. The DTS-CBE provides students with sufficient knowledge and skills to be employed after two years of education. Moreover, they still have the option to continue studying Microfinance while working because the program is ladderized. Janice Ogao was a scholar when she took up microfinance in Bicol University. Her mother is also a microentrepreneur--she made fans from anahaw; her dad is a farmer. She was in fact somewhat familiar with how microfinance helps fledgling businessmen as her mother had a loan from Center for Agricultural and Rural Development for her livelihood. The industrious family approached Fr. Jovic Lobrigo, a microfinance stalwart in Bicol, when she finished high school for the opportunity to study in a university. Janice took full advantage of the opportunity. She worked hard, learning the "fundamentals" of microfinance, and built on that knowledge as an on-the-job trainee for Simbag sa Pag-asenso, Inc. After she finished studies, the microfinance institution immediately offered her a job as community development organizers. Janice is currently responsible for "baranggay mapping, community profiling, organizing groups, monitoring of members, and recommending loans for the members to approve," according to Brenda. Janice says she really "enjoys" her work, and even recalls going to far-flung Batan Island to monitor the community as one of the memorable experiences of her budding microfinance career. "Mababait sila. They are very hospitable at pinagkape pa nila kami." It was also fulfilling for her to be able to provide half of her first salary to her "mama." Moreover Janice finds great fulfillment in being part of microfinance and its cause of providing people with means to make their lives better. 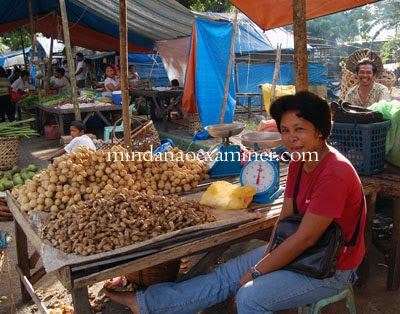 She tells of a variety store in Legazpi that grew with help from a loan from Simbag. "Ngayon naka-avail na sila ng stall. Masaya yung may natutulungan ka sa trabaho mo." Dr. Ramesis Lorino, Industrial Coordinator for Microfinance and Assistant Dean of Bicol University, is proud of the achievements of Janice and his other former students. He cites the students who have earned Certificates in Microfinance as budding agents in the microfinance community's mission of alleviating poverty through people empowerment, and not through charity. Dr. Lorino says: "Microfinance is a vital tool for poverty alleviation. It addresses one of the major and very common problems in the Philippine setting - poverty. I would like to quote one of the statements that our colleague had said 'as long as there is poverty, there is microfinance'. And so I thought, it is impossible to eradicate poverty. Alleviation is the answer. The existence of microfinance is somehow forever. It's a good thing that our students and hopefully future microfinance practitioners earn and at the same time help the community especially the poor." "Bicol University is a premier state university in the Bicol Region. Improvement on the lives of every Bicolano is a part of its vision and mission. Through the offering of the microfinance program poverty will be alleviated. The stakeholders will also be given opportunities to earn and learn."